Blood, sweat and belly binding: Why choose Bengkung belly binding for your belly wrap? Belly binding after birth is becoming more and more popular, and although the this practice has been around for thousands of years, we in the United States are just hearing about it - mainly thanks to the advertising and marketing of company’s such as Belly Bandit®. Hospitals are handing out various types of binds, and word is getting around about the benefits and wonderful support that belly binding can provide. Since there are so many methods and binds out there, I thought I’d show a comparison between Bengkung belly binding and the more modern binds sold online and in stores. I’ll save a post about the benefits of belly binding for another day (or you can read the cliff notes here). Let’s face it, you probably wouldn’t be here if you weren’t curious, or weren’t considering using a wrap of some kind. You’re just trying to figure out what kind is best! So without further ado, let’s get into the differences between Bengkung Belly Binding vs other belly binding wraps. Bengkung belly binding provides even support from your pelvic bone to your breasts. It can provide the same even amount of support from top to bottom and from back to front . Alternatively, it can be adjusted to be looser at some points and tighter on other spots. Can you get that with the store kind? No, it just isn’t going to be possible. Even if it did compare in this department, there is still so much more to consider! Sometimes Velcro breaks down after multiple uses. You may find the tight fit that you felt at the beginning is starting to wane. Next thing you know, you’re looking for the duct tape to hold it all together. The material that I use for Bengkung belly binding is strong and durable. It holds up wash after wash, and never loses it’s ability to do it’s job. Each wrap is hemmed and surged on all edges to prevent frays. Most importantly, the surged edges DO NOT bunch up or dig into your skin. Comfort is a pretty big deal when you have liquids poring out of every orifice of your body. Here in Texas, in the summer it’s HOT and HUMID. As I look at the various binds out there on the market, most have a few things in common. Elastic, and Velcro. No matter how soft and breathable they claim for their bind to be, there certainly is a lot of materials needed to keep the wrap fastened and taught. (Velcro, spandex, elastic, whatever). None of these materials allow the skin to breathe nearly as well as a giant piece of cotton, muslin or batik fabric. Postpartum moms are already sweating after they give birth, no need to turn the faucet on any higher! Speaking of materials, sweat and heat - what about washing that thing? The ones that you can purchase at the store are almost always going to instruct to hand wash. Yes, HAND WASH, not even use your washer on the ‘hand wash’ setting! It can take 12 hours or so to dry. They encourage purchasing two of them so you can wear one, while the other one is out of commission. You can purchase two Bengkung belly wraps if you’d like, but the one that I provide, is machine washable and most can be washed and dried over night when you aren’t using it anyway. You are already sleep deprived, are you sure you want to add hand washing to your postpartum schedule? (I know you are thinking this could be a job for your mother-in-law, but even she deserves the luxury of using a washing machine)! When you get your belly bind, it’s not going to ask you how you are doing. It can’t wipe away a tear, while you vomit out how crazy your mother-in-law is making you. It can’t provide you with local resources on breastfeeding, support groups, baby wearing, or whatever you might need. Some women just need to get it all out, and some women just want to do the wrap! Either way, you are getting support. (Slight pun intended). When I come to your home you may just want to get down to business, learn how to wrap and be done. I can do that! I’ll do it as quick as possible, and chat as little as possible. I can be out the door in less than an hour. Some moms would like me to spend more time while they chat and ask lots of questions. They want to talk about their new baby, maybe even ask a question or two about breastfeeding or ask how to use their new pump. As a childbirth educator, a doula, a mom to six, and a breastfeeding counselor, I just might have some answers! I’ll be happy to help you with a breastfeeding session while I’m there. The store bought wraps just don’t compare to a walking birth, postpartum and breastfeeding encyclopedia. P.S, if your wrap *is* talking to you, you either haven’t slept for a week or you need to contact your health care provider. So there you have it. You’re a smart consumer! Which one provides you with the best physical and emotional support - while also supporting your local business? The Serenity Difference: What Sets My Childirth Classes Apart? Childbirth classes are not all alike, but much of the information is the same. We all discuss stages of labor, most all will discuss some comfort measures, and provide the rest of the basic topics in various formats. What goes into them beyond that varies widely. 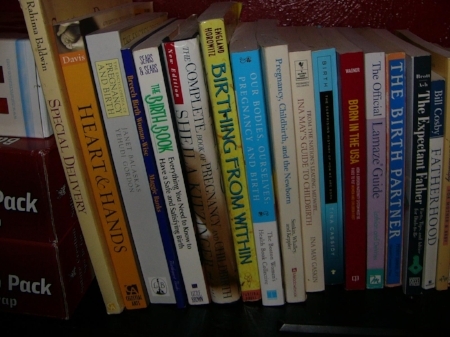 I took the basics, combined it with some information that I learned from my doula training, sprinkled in information from all of my other training's, and made the most direct, informative - “I didn’t’ know I needed to know that” childbirth class series I could. I have had many clients come to me for their 2nd or even 3rd births, who have tried various childbirth classes previously, tell me they learned more from me in one class then they ever did in the other classes combined. My classes aren’t any longer than other classes, it’s just that I have the freedom to cut out cheesy games that introduce people to each other, and get things rolling. Let me tell you what sets my childbirth class series apart from the rest. There is something for everyone. I have tons of additional information to supplement your classes. Tons of handouts, in the form of a 145+ page binder, colorful booklets if you just want the highlights, and video access for those who just can’t stand to read at all. As far as I know, I am the only person in this area that provides my clients with a labor tool kit to take home and use before, during, and after labor. Clients will be shown how to use the tools in "class two" of the series, and practice again in the final review. Large classes means less information. The more people in the room, the more time we have to allow for breaks, for questions and answers, and overall instructor content. Because I keep my group classes to a maximum of 4 couples, I can provide more information in the same amount of time. I still have time to answer the various questions, and because the class is more intimate, most everyone feels less shy about asking them as well. Learning comfort measures is paramount to childbirth education! Even if a mother is planning on an epidural it helps to learn how to cope until she gets it. She also needs a backup plan, in case she can’t have one come labor day. I can’t tell you how many people I have taught my comfort measures class to that did not learn how to do certain things from other childbirth classes. Some of them learned about the techniques but didn’t get to practice them, and everyone says they didn’t learn as many coping techniques over all. I like to show a technique, then let the partner practice so that each mother has an idea of how it is supposed to feel. You just can’t do that in a large class, because you don’t have enough time to do that one-on-one. OH, and if you are a single mom? I have plenty of tricks to show you how you can do many comfort techniques by yourself!!! I get calls every day asking when my next childbirth class series starts. Most childbirth classes series have a structured time frame. Most educators teach a group series one day a month, sometimes two days a month. For example they teach every Tuesday on an ongoing basis. Not everyone can make a Tuesday night class. They call around, classes are either full, have started already, or they simply can’t make the night of the week so they forgo classes all together and ‘wing it’. I teach a childbirth classes every day, excluding Sundays. That's 6 days a week. I teach group classes, and private classes. If you can’t make the next series, or it doesn’t fit your crazy schedule, then take the classes alone, and you will learn a ton in a very relaxed setting! The best part? You pick the time of day we start. I teach classes as early as 8am and starting as late as 8:30pm. Want to know what else? You don’t have to take your classes on the same day every week! You don’t even have to take the class once a week for 5 or 6 weeks. Schedule your classes bi-weekly, once a month, whatever you want, - whatever helps you learn the best. I will always offer to teach your final review closer to your due date if you start early. Speaking of ‘early’. You can start whenever you want. I don’t care if you are 10 weeks pregnant, you can start with my “Early Pregnancy class” and schedule the childbirth class series a couple of weeks after that. Couples often opt to take the first four classes in my childbirth series, and then take the newborn and final review around their 35th and 36th week. Sometimes people procrastinate. Maybe you didn’t know if you could even give birth vaginally due to a low-lying placenta, or maybe you just had other things to tackle before you could think about giving birth. Suddenly you realize you are 36 weeks and need something quick! I can handle that. I can’t guarantee you’ll get completely finished before you give birth, but I do my best and offer many options. I can sometimes offer to do three classes in a week, or two 5 hour sessions, or one 8 hour session. This especially works if you can accommodate a class during the day. Whatever we can do that works with both of our schedules, and provides you with just the amount of information you need to be prepared. I keep it current and non-judgmental! I stay up to date on the latest research and evidenced based birth practices. Some childbirth instructors are not allowed to provide any information other than what is ‘in the script’, and even though they know it’s outdated information, they are stuck. I stay current, so you can too! Hospital based educators have struggles too. (I know I’ve been there). Certain information is ‘not allowed’, and information can be presented in a very different light. For example, some instructors may not tell you that you have more than one option for cervical ripening, because the majority of providers only use one or two methods. You may not learn what a cervical ripening is or for! Information can sometimes be one sided. For example, your instructor might tell you - this is what an epidural is, and this is when to get one. There may not be any discussions about the risks, or benefits to going without one. I once heard of a nurse who told a class that there were no side effects to an epidural and that women were crazy if they considered going without one! You will never hear me tell you that you are crazy - no matter which way you choose to birth. This is your choice! I would like my classes to be a judgement free zone. I have the pleasure of getting to know each and every one of my students. I want to know where they are birthing, who they are birthing with, and what their goals are. I know what their fears are surrounding their upcoming birth . Each person has a unique situation, and in a large group setting you can’t always keep the topics relevant for each person. If I have a group class, I try to group those who are birthing in a hospital setting together, those who are birthing in a birth center together, those who are going for a VBAC together, etc. This way the information is relevant to their situation. There are times when I have a mixed group, but I still remember who is doing what, so that I can tell them when I am talking “this doesn’t apply to you” or “you will have this option, but not this one”. Each person that comes through my door will get information relevant to them. Not everyone wants to go natural, not everyone wants an epidural. Births don’t always go as planned. I provide all the information for both situations, and provide clients with the information to best achieve their birth goals. What they do from there, is up to them! I know many of the providers in the area. I am familiar with most all the hospital policies. I know if your hospital has a squat bar, or birthing balls, wireless monitoring etc. Many times women who can’t take a childbirth class at the hospital they are birthing at, call around to other hospitals and take a class there. Taking a class ata different hospital can be confusing. It’s cheap, but not relevant. Hospital policies are not the same - even if they are under the same system. It’s important that you understand what is available to you. Since I have worked at most hospitals, I have the inside scoop. I will provide you with all the tools you need to make your birth the best you can under your specific circumstances. Who doesn't want a well-rounded class relevant to you, non-judgemental, and packed full of the information that you need?! Learn your options, go from there. As Diane Korte says, “If you don’t know your options, you don’t have any”. I look forward to meeting you!